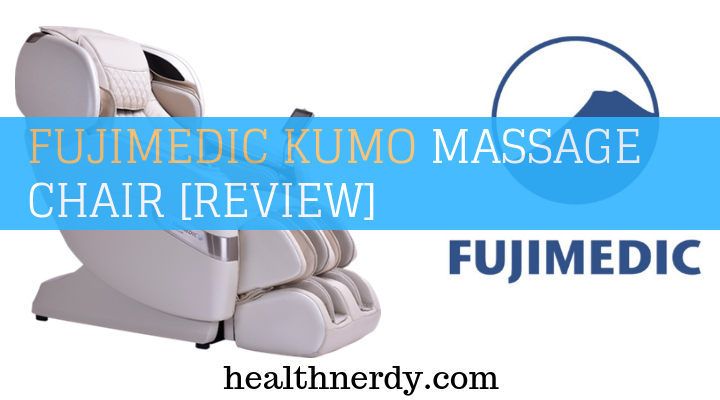 Fujimedic Kumo Massage Chair Review (2019): Is This Chair Worth It? You are here: Home / Holistic Health / Massage / Chairs / Fujimedic Kumo Massage Chair Review (2019): Is This Chair Worth It? I’ve reviewed a lot of massage chair brands so far, and none of their names are as suggestive as this one. 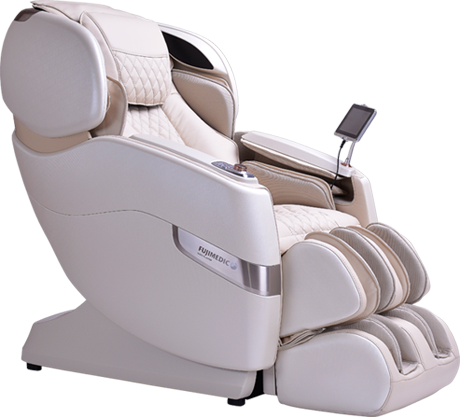 The Fujimedic Kumo Massage Chair is a first Japanes L-Track massage chair with 4D massage rollers. 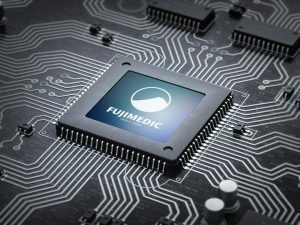 Is Fujimedic FJL50 Worth The Hype? But that’s exactly how I would describe the Fujimedic Kumo: strong and with a great therapeutic impact. On the other hand, the chair from Luraco has even more therapeutic functions, which is why it might be a better alternative. If you want to learn which chair is the best in the word, read my best massage chair guide. A Japanese health and wellness brand, Fujimedic has over two decades of experience in the health field. 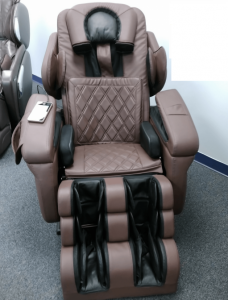 Established in 1996, the company started in the import-export business of massage chairs and accessories. Fujimedic is included in a global manufacturing corporation, and it has offices in Asia, Europe, and North America. 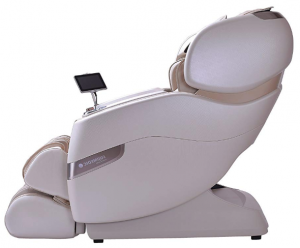 The Fujimedic chair is the first massage chair made in Japan that features an L-track instead of an S-track. 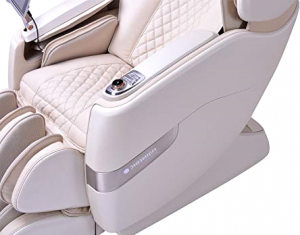 This massage chair also features 3D/ 4D heated rollers, mechanical foot rollers, 64 airbags, zero-gravity, space-saving technology, memory function, Bluetooth connectivity, plus the therapeutic knee and calf heat. It also comes with a 3-year warranty for the parts and labor. This is a therapeutic function that recommends Kumo for people who have high blood pressure, plantar fasciitis or arch pain. Kumo’s intelligent ottoman is made from two parts that move independently, so the upper part massages your calves and knees, while the lower part massages your feet with ancient reflexology methods. The heated knee massage will alleviate pain from stiff joints and improve your blood circulation, while the reflexology foot massage is deep tissue. In fact, the foot massage is a combination of air compression with kneading and stretching techniques courtesy of the rollers. Besides, the ottoman features smart sensors that gauge your leg length and adjust so you can benefit from a customized massage experience. Did you know that “Kumo” means “cloud” in Japanese? 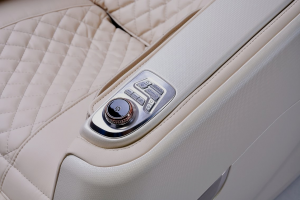 With that in mind, you can see why the thorough air compression massage this chair can offer is one of its best features. 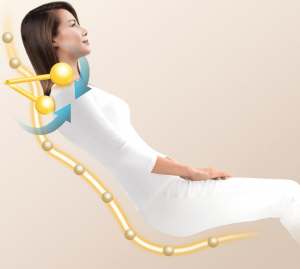 With 64 air cells that envelop your whole body, you’ll benefit from a sequence of squeezing and pulsing movements that feel much like what a chiropractor would do. This is a relaxing experience, but it also unwinds tense muscles and improves blood circulation since the air cells can massage pressure points that the rollers don’t have access to. The touch screen remote control shows real user-friendliness because it’s easy to use and to see. Its intuitive interface makes it easy for users to access all the massage options and customize their preferences. The interface is based on the principle of simplicity: you just tap the screen to get to where you need. 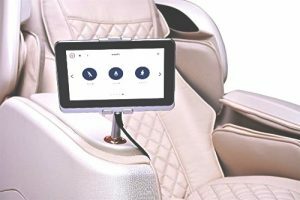 You can even see the current features of your massage as you’re in a chair on the large 7-inch screen. I also liked the arms touch dial that really improves the massage experience because you can make fast adjustments during the actual massage. There aren’t many language options for the remote, though. Apart from English and obviously Japanese, you get just Vietnamese, Korean and Chinese, with no other European languages. Patterned chromotherapy is not something you see with every massage chair, though it has real therapeutic purposes, such as reducing stress and anxiety, improving your metabolism and activating your immune system. Basically, chromotherapy is so relaxing that your brain releases endorphins and serotonin, which are feel-good hormones that decrease your stress levels so that your body can focus on healing. With 7 modes to choose from, the effect of chromotherapy is enhanced by the surround sound Bluetooth speakers. The speakers allow you to connect your phone or tablet to this chair, so you can listen to your favorite playlist and help relax you faster. Unlike standard massage chair, the Fujimedic massage chair focuses on providing therapeutic massages with a human touch, which is why it features deep tissue massages and heat therapy with 4D heated rollers. Thanks to the 4D technology, the rollers can move up-down, left-right and inward-outward on your spine. Considering they can travel 3 inches from the L-track and get up to 1.5 inches apart, they offer a penetrating and effective massage that touches various acupuncture points. The rollers are heated, which unwinds sore muscles and also feels like the touch of human hands, but there’s no real heat therapy to speak of with this chair. Moreover, there are four intensity levels for the rollers, which you can adjust either with the remote or with the touch dial on the arm. So if you don’t like deep tissue massages, you can always opt for a softer one. Just like an S-track, an L-track is ergonomic, following the natural curvature of your spine in order to massage all your pressure points, but it extends all the way down to your glutes. In fact, the track is 44-inches long, so it provides full back coverage for most people, with rollers that move from your neck, shoulders and upper back to your lower back and glutes. This is a significant advantage for people suffering from back pain. Most times, compressed discs or sciatica pains can’t be alleviated by a shorter S-track, but by rollers who can effectively massage your buttocks and upper hamstrings. 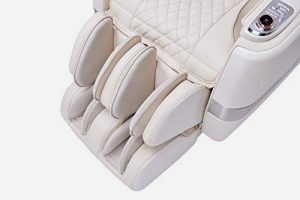 The rollers are fitted with sensors, and the whole Kumo massage chair benefits from high-end technological advancements, meaning the computer will create an accurate image of your body shape and size. This helps customize your massage experience according to your body type and effectively relieve all sorts of aches and pains. There are 12 built-in massage programs to choose from, as well as various massage techniques from around the world. Combining those leads to about 500 options, so you can easily personalize your massage by selecting the area to focus on and the massage technique. Besides, the memory function allows you to save a maximum of three custom massages. The massages I liked best are Spine Care, which deep massages your lower back with air compression and Japanese, which relieves shoulder pain with an acupressure effect thanks to the Shiatsu technique. The zero gravity option, which allows the backrest to recline and the ottoman to raise so that your body weight presses on the massage rollers. This allows for a deep tissue massage, while also decompressing spinal discs in order to reduce back pain. However, for such an expensive chair, I would have liked to see more zero gravity levels. The Luraco is a medical massager designed and manufactured in the US, plus listed with the FDA, CE, and UL. Just like the Fujimedic Kumo, the Luraco chair features powerful speakers for an immersive massage experience, 3D massage rollers, and zero-gravity. But the Luraco has more therapeutic functions which are why I think it’s a better chair. The combinations of built-in massage programs and massage techniques range from deep-tissue to firm body stretches, and you even have a zone massage option that allows the rollers to focus on a specific pressure point. You can also adjust the roller speed and intensity; there are 5 memory settings (2 more than the Kumo has to offer), plus real heat therapy for your back, seat, and feet. There’s no chromotherapy, but you get built-in blood pressure and heart-rate monitor to help you adjust the massage type and intensity. You can buy the Fujimedic Kumo from the official website or from Amazon. 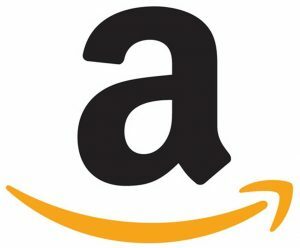 These are the best two places to consider because they offer best value and shipping plus warranty, and returns. White glove delivery is possible as well! It is relatively new chair and not tested by many users and not many reviews available at this point (I will update when it is). Otherwise, Luraco i7 Plus is a better alternative. Fujimedic Kumo Massage chair is great for relieving stress and delivers a heavenly leg massage, the Luraco has more therapeutic functions.